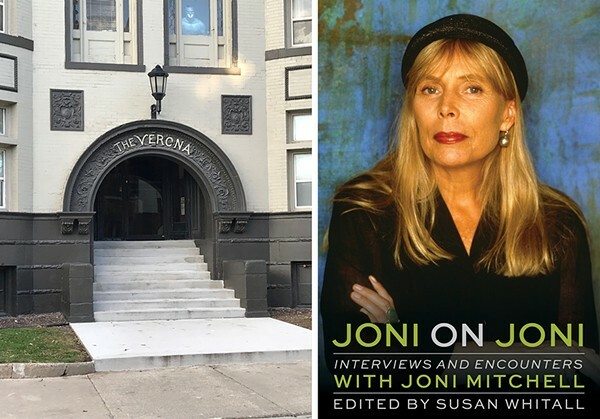 For Susan Whitall - a Detroit music journalist; former editor of "America's Only Rock 'n' Roll Magazine," Creem; and author of Joni on Joni: Interviews and Encounters With Joni Mitchell (Chicago Review Press) - Mitchell remains a bit of an enigma, despite Whitall having spent six months immersing herself in Mitchell's every documented word. Perhaps one of the lesser known periods of the Canadian singer's life, aside from having polio as a child and the traumatic pregnancy that forced Mitchell to surrender her child due to financial hardship, is that of her time in Detroit - a city Mitchell later described as "decadent and internally decaying" to the London Evening Standard. She met her first husband folk singer Chuck Mitchell in Toronto and married soon after in Rochester Hills during the summer of 1965. They would move into Chuck's apartment within the Verona, a five-floor walk-up in Detroit's Cass Corridor. Though the marriage was short-lived, Detroit, as Whitall points out, was a critical turning point in Mitchell's career. Whitall writes, "Such early songs as 'Both Sides, Now' and 'Circle Game' sound as if they were written under endless prairie skies, or in hippie California, but it was in a gritty Detroit that Joni scribed their lyrics in a coffee shop." This article has been viewed 942 times since being added on November 21, 2018.